Two weekends ago, I spent a good part of my Saturday evening composing a new hymn tune at the request of my pastor. I had mentioned to him that if he came across a hymn that he felt needed a more appropriate tune, I would be happy to help, as I have been wanting to do more hymn tune composing. He wanted us to sing Psalm 130 on Sunday but only had a version set to the tune MARTYRDOM, which while a nice tune, did not adequately match the deep lamenting of the Psalm. So I set about composing a new tune for Martin Luther’s paraphrase of the Psalm. Our hymnal did have Luther’s paraphrase set to the tune AUS TIEFER NOT, a tune attributed to Luther himself, but the version of the tune in our hymnal was too metrically irregular to facilitate good singing. 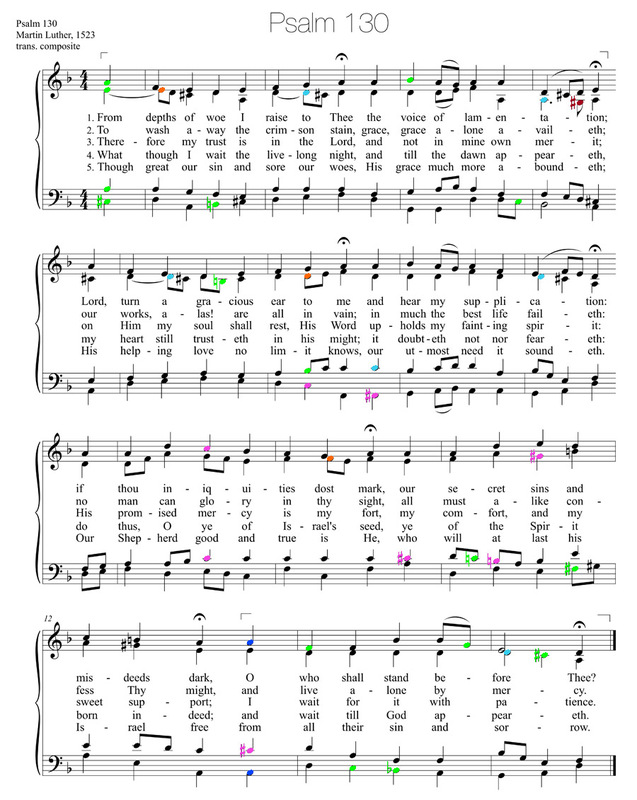 A version of the tune with some rhythmic modifications compared to our hymnal is available here. Incidentally, Bach composed two wonderful works based on the tune: a 6-voice chorale prelude and a cantata (more info here). I knew Bach’s chorale setting of the tune, found at the end of the cantata, but did not put 2 and 2 together until after composing my own version. 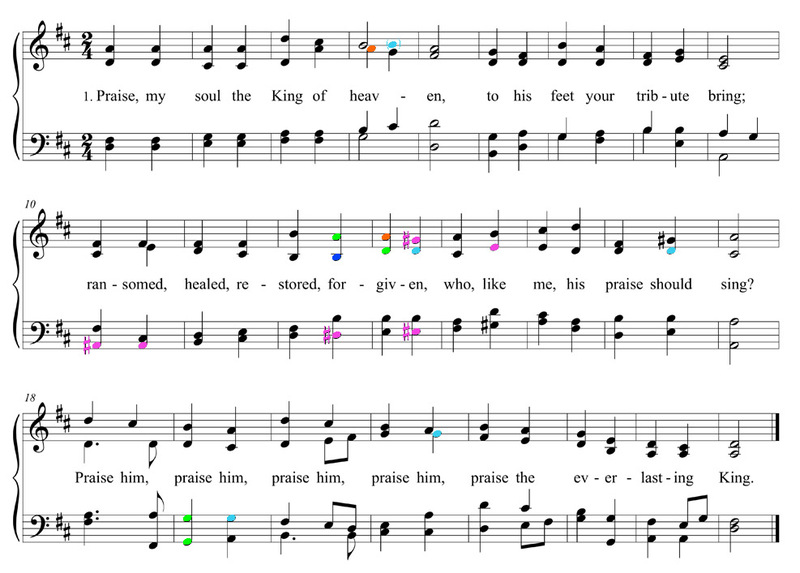 At any rate, having my color-coded analysis fresh in mind from a recently written blog post, I found myself thinking of ways of applying the color code during the composing of the hymn. I literally began thinking in color. The more I thought about it, the more I began to realize that if the color code is useful at all, hymn tune composition may be one area that it is most useful. 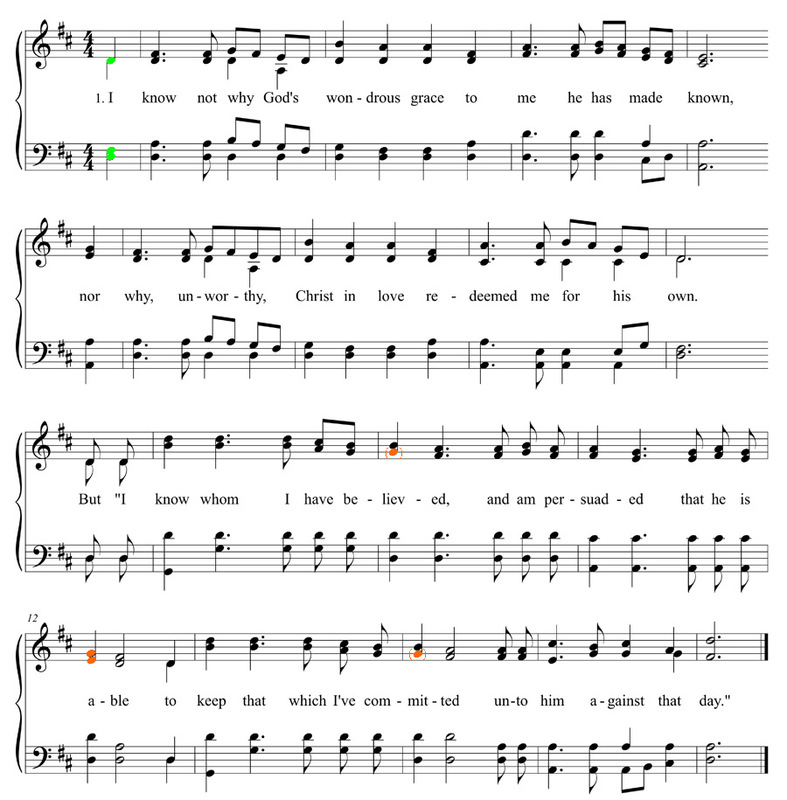 The hymn tune writer is concerned with matching the expressive subtleties of the text in a chordal setting, and it is the expressive musical qualities that the color code was devised to highlight (rather than other musical features such as large-scale form). The simple setting I composed ended up being very Bachian. This was both perfectly fine with me as long as it was appropriate for facilitating good congregational singing of the Psalm and perfectly understandable given the extent to which I’ve been immersed in Bach’s chorales. In fact, the final phrase bears a striking resemblance to that of Bach’s well-known Jesu meine Freude chorale (“Jesu, Priceless Treasure”), both having identical bass lines. Other Bachian features include the number of voice-exchanges, the cadential formulas, and the soprano-tenor imitation in the final phrase. A black and white copy of my setting is available at http://www.lukedahn.net/Scores/Psalm130.pdf. A color-coded version is below. One of my most color-conscious decisions was to save the highest saturation of brighter colors for phrases 5 & 6. Other color-coded thoughts (The color-code is described here): Given the prevalent use of the minor mode, more light green notes naturally appear due to inflections of the 6th and 7th scale degrees. I balked at which color to render the alto’s G# in measure 4. Does the raised scale-degree 4 of an Italian augmented sixth chord tonicize the dominant? If so, it should be light purple or bright red. Does it create a chordal dissonance in this root-less chord? If so, it should remain maroon. Or is it more characteristic of a lower chromatic neighbor tone? It so, it should be light green. I chose maroon (NH) since it both creates a dissonance with the bass (augmented 6th) and is considered a chord tone, and since it becomes an activated tendency tone, gravitating to scale-degree 5. At any rate, you probably by now know the kinds of late 19th c. American hymn tunes I have in mind: simple triadic harmonies (usually just 3 of them, but just 2 is not unheard of! ), slow and regular harmonic rhythm, homophonic texture, folk-like melodies, occasional dotted rhythms, and (worst of all!) occasional double lower chromatic neighbors! (Wince!) Composers of these kinds of hymns tunes include Robert Lowry (1826-99) (What Can Wash Away My Sins; Shall We Gather; I Need Thee Every Hour), Philip Bliss (1838-76) (I Am So Glad That Jesus Loves Me; Wonderful Words of Life), William Doane (1832-1915) (I Am Thine, O Lord; Near the Cross; To God Be the Glory), and James McGranahan (1840-1907) (I Know Whom I Have Believed; I Will Sing of My Redeemer; There Shall Be Showers of Blessings). The McGranahan tune is one that I grew up singing in church and one that I liked as a child. Aside from the green opening notes (which would be rendered green only on the first verse, of course), the only colored notes appearing are four orange notes (orange representing prepared non-harmonic tone dissonances, like suspensions). Two of these, on the words “be-liev-ed” and “com-mit-ed”, could easily have been rendered light blue since they are dissonant fourths above there basses and can be thought of as part of the IV64 chords they harmonize. They function, however, as double suspension figures (along with the soprano in each case). I could very easily have chosen a hymn from this tradition that would be rendered entirely black. The John Goss tune is a favorite of mine. There are many reasons why I think the tune is so musically appealing, several of which are in stark contrast to the style McGranahan represents. I particularly love the way the first phrase contributes an asymmetry to the large-scale phrase rhythm of the hymn. Phrase 1 is the only 5-bar phrase (with special agogic emphasis on the word “heaven“) and renders the hymn’s phrase structure as 5+4+4+4+4+4. The harmonic rhythm accelerates in phrase 2 (quarter-note changes) after a stable phrase 1 (half-note changes). The idea of accelerated harmonic rhythm is quite simple, but it’s effect here is significant, for it supplies momentum heading into the middle phrases which are even more harmonically charged. Goss saves any tonicizing for these middle phrases (no chromaticism in phrases 1 & 2 or 5 & 6) – the rising diatonic bass line from phrase 1 now becomes chromaticized in phrases 3 & 4. In the process, the subdominant, the supertonic, and the mediant are each tonicized in turn before achieving a full modulation to the dominant. Phrase 3 also begins with the same half-note harmonic rhythm as phrase 1, but the slower pace cannot be sustained; the harmonically-charged bass ascension will not allow it. Phrases 5 and 6 return to the tonic key (by transforming the PAC in phrase 4 into an HC) and to a diatonic harmonization. In contrast to phrases 1 & 2, here we get a rhythmic activation (passing tones) that provides an added sense of elation appropriate for the “Praise Him” repetitions. Phrases 5 & 6 provide a wonderfully satisfying conclusion: the ascending bass line returns once again, and Goss has brilliantly utilized the 1-7-6-5 line from phrase 1 (“King of heaven”) to bookend this wonderful, thoughtfully-constructed hymn tune. This entry was posted in Uncategorized and tagged analysis, color-code, Composition, hymn. Bookmark the permalink. I think Aus Tiefer Not is a great tune matching the mood for “From Depths of Woe I Cry to Thee.” The Lutheran Hymnal version my church uses is also very nice for congregational singing. It’s one of my favorite Lent hymns. Just curious how you think your tune compares to the mood created by Bach’s chorale version of Aus Tiefer Not.